Feet are weird—and everyone’s are different. Why suffer through the pains of a factory-created cruel shoe when you can customize the fit of the most important gear you own. Runners and hikers are always looking for footwear that fits as if it were designed just for them. Now, a couple of Colorado retailers are able to offer customized shoe insoles and hiking boots that fit better than anything off the shelf. 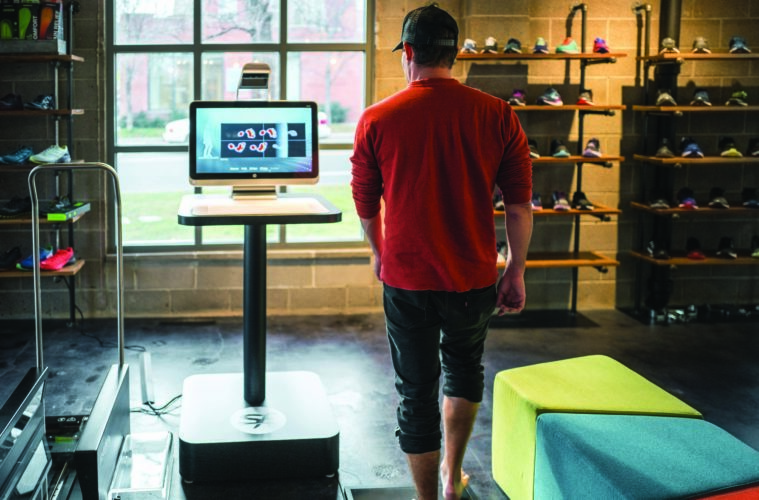 Boulder run shop Go Far has the region’s only SuperFeet FitStation, which digitally maps the shape of runners’ feet. Wilderness Exchange in Denver offers the Tecnica Forge boot, heat-molded to fit customers as they wait. Kate King, Go Far’s operating manager, says the greatest power of the machine is to help customers visualize the different shapes of their feet—a person’s feet are almost always different from one another—and help alleviate imbalances that can lead to uneven wear, blisters or even injury in other parts of the legs. Customers step onto a scanner for a 3-D measurement of their feet, which includes the width of their toe box and height and length of their arch. Another mat measures their gait to detect pronation or supination. This data is then saved under their profile in the FitStation computer, and recommends shoes in Go Far’s inventory as well as stock insoles from SuperFeet. For an even more custom fit, customers can use their data to order soles 3-D printed to fit their feet and have them arrive in two weeks. For hikers, Tecnica’s custom-fit machine molds the foot-bed and upper of the waterproof Forge boots, which has won plenty of accolades for its performance features. First used in its alpine ski boots, Tecnica’s custom fitting is a two-step process that takes roughly 20 minutes. Customers take a seat in Wilderness Exchange’s footwear section and strap their feet (and legs) inside Tecnica’s molding machine. In the first step, air pressure fills compartments around the feet and even above the knees to add pressure to the soles to shape the foot-bed. Next, the uppers are molded around the heel pocket and ankle for a secure, comfortable fit that’s ready to hit the trail. “There’s been an education process, as people still think they need to break these in,” says Ben Arnold, a manager and certified boot fitter at Wilderness Exchange. The store got the molding machine and two boot styles in February, and Arnold says he saw an immediate interest, especially among blister-prone hikers with difficulty finding boots that fit well and others with more complex issues. “When you’ve got a bad injury, like a bolt and screw in your ankle, you’re just not going to find a stock boot made to fit that.” He says it doesn’t hurt that they are great three-season boots, with a slip-resistant tread and breathable waterproofing.